Swing has now come to Jerusalem and other cities in Israel, thanks to Holy Lindy Land, an organization founded by a group of dedicated dancers . Weekly classes, street parties and concerts with the best jazz bands are just part of its activities whose purpose is to expose many peoplethe the pleasure of swing dancing. 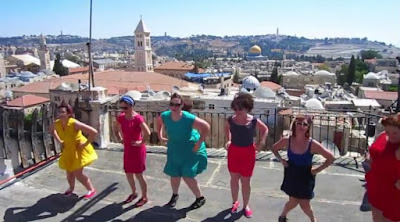 In this video, Holy Lindy Land teams and dancers from Jerusalem, Tel Aviv, and Haifa bring the Charleston to familiar locations all around Jerusalem. Love your blog. You bring sunshine into everyone's life.